The What: Christie has added the Extreme Series to its Aspect family of LCD video wall panels. The new series consists of four models: FHD553-XE, FHD553-XE-R, FHD553-XE-H, and FHD553-XE-HR, and includes a range of brightness levels and features an advanced electronics platform with an optional redundant remote power supply. The What Else: Featuring advanced panel matching, the brightness and color of each panel comes pre-calibrated, eliminating much of the image adjustments typically required when installing video walls. The Smart Light Control feature can automatically adjust the brightness of each panel for uniformity across the entire video wall and maintain consistent performance throughout its lifetime. 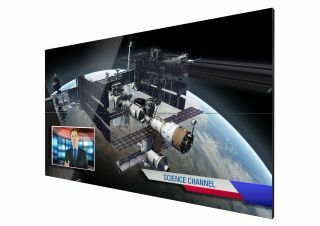 With an OPS slot, these panels accept a variety of embedded processing modules, such as the Christie Phoenix EP, for a complete video wall solution for critical viewing environments. The Bottom Line: With its extremely narrow bezel, the Extreme Series is suitable for government facilities, public utilities, security and surveillance, telecommunications, and transportation. The Extreme Series is also well suited for artistic/architectural displays, corporate lobbies, higher education, retail outlets, financial institutions, arenas, and stadiums. The Christie Extreme Series ships in January 2017 with a three-year parts and labor warranty.